Beautiful certificate from the Lincoln Aircraft Company issued in 1929. This historic document was printed by the W. N. Perrin Co N,Y. and has an ornate border around it with a vignette of Abe Lincoln. This item has the hand signatures of the Company’s President ( Victor Roos ) and Secretary ( Charles Carroll O'Toole ). 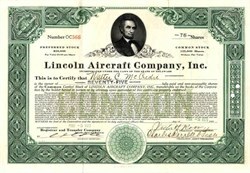 The Lincoln Aircraft Co. of Lincoln, Nebraska was a well-known aircraft manufacturer of the 1920's and 1930's. They merged with the American Eagle Aircraft Corp. of Kansas City, Kansas in 1931. In September 1927, Clyde Cessna and Victor Roos formed the Cessna-Roos Aircraft Company. Later, the Cessna-Roos Aircraft Company became incorporated as the Cessna Aircraft Company after Victor Roos left. Victor Roos was also the former general manager of the Swallow Airplane Company.